GM David Smerdon is going to represent Australia at the Chess Olympiad in Istanbul on board one. I am proud to say he is also a former student of mine. Disclaimer: I am not taking credit for his achievements. He would have become a GM anyway due to his interest in the game and great work ethic. I did however enjoy our sessions on the Gold Coast in the 90's. Not only is David a great chess-player but also a gifted writer. This has been recognised by Chessvibes, who gave him a spot on their very popular website. His latest post mirrors my opinion on the current World Chess Championship in a very entertaining way. Although written after game 9 nothing has changed since. Most of the questions are about the validity and value of the match and the high percentage of boring draws not seen since Kramnik-Leko. Oh yeh, 6-6 and now we will see some rapid games and then we will have a winner. I don't really care any more. It has been a long time since the strongest player was the World Champion and we have to go back to Topalov to find one who played entertaining Chess. Alexei was cheated out of his chance and Kramnik went on to defend the title against Leko and Topalov finally succumbing to Anand. This is what Alexei did to Vlad in the last game of their match. Why Nigel? Well he went along with Garry but who can blame him too much? It was a big pay-day. Enough ranting for now, we'll just have to wait for the next big tournament to see the best players play. One more thing, I found an old picture I would like to share with you. We are ready to go this Sunday. There are still a few places left. Once we reach eight the group will be closed. Am watching the live transmission from Moscow and listening to Peter Svidler explain the World Championship game. Draw :( I was just about to type that it looks like an interesting position. Back to memory lane. David Ferris retired with an ELO of 2325. I don't know if he still plays social or club Chess at home, which used to be Canberra. Drawing with David was a good result although undeserved. His extra b pawn should have carried the day. A few years later the boot was on the other foot. 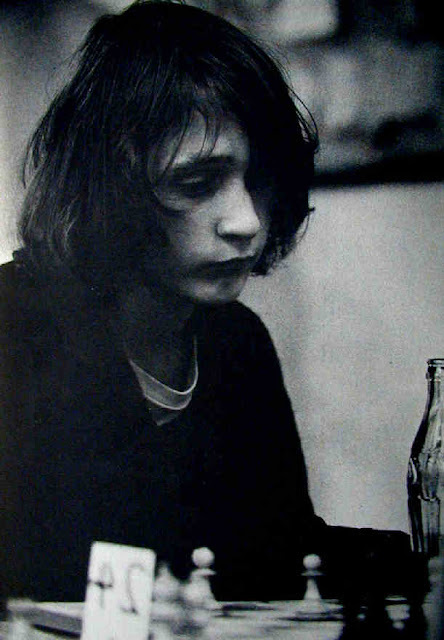 While Richard had wasted his youth earning a degree and building a career, I had concentrated on Chess! He did make it into the BRW 200 list of the wealthiest Australians but his Chess has suffered. This game demonstrates the "good knight" v "bad Bishop" theme. End of the tournament patient reader, no more Schwaiger games....for now. 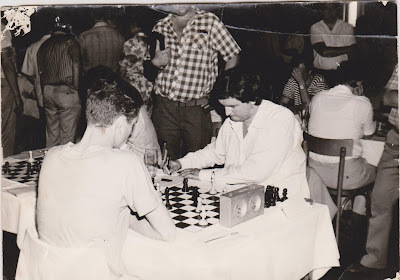 Greg Hjorth is a name known to all who played Chess in Australia in the late seventies, early eighties. By the time I had learned the moves in 1978, Greg had been a prodigy for many years. We met at a Chess camp where Australia's best players including then, number one IM Robert Jamieson were instructing Juniors. Greg offered to play me 1 minute to 5 and a Queen start. We became good friends and would often look at chess together. One of Greg's more imaginative (crazy) ideas was to play d6, Nd7, e6, Be7, Nf8 and g5! launching an attack on the hopefully castled white King. Greg was smart enough not to play it in serious games (to the best of my knowledge) but I could not resist. First an unsuccessful attempt against Haydn Barber! Terrey Shaw was one of Australia's leading players back then, former winner of the Doeberl cup, First equal in the 1977-78 Australian Championship and member of the Olympiad squad not to mention one of Australia's very few International masters back then. An enormous challenge as you can imagine, considering my rating (1895) and position in Australian chess. But so stubborn and arrogant was I at that age that I was going to try the "Hjorth Attack" again despite the drubbing given me by Messrs Brown and Barber. Luckily for me Terrey attacked before I could misplace all my pieces and forced me into a normal position. Greg meanwhile crushed everybody and won the tournament. Andrew Martin's commentary is the easiest to understand for casual players. On the official site you can watch the games live with special guest appearances like Kasparov and Karpov. Doesn't get much better. Chessvibes is my daily first-coffee site and again they have great reports. Youtube has a good video of game 7 commentated by someone who sounds like Michael Caine (IM Andrew Martin) and for analysis and some interesting gossip go to Susan Polgar's website. I predict the next few games will be a lot more exciting as Vishy now has to go all out to win a game, otherwise the title he has had since 2007 will be gone. Will the real Vishy please step forward! Two more Schwaiger (aka Wohl) games for you. I am less impressed with this effort against Phil Brown, one of the great NSW players of the period. The opening I will explain in my next post. 29...Qh3 is a move that I would never play these days. Decentralising to be near the white King without any supporting pieces. The misplaced aggression of youth. Here in round 3, I was again paired down. Noticable is that again the Queen's Rook ( 15Ra-e1) was activated before concrete operations. Anyway, despite some minor technicalities we are ready to offer our first course. 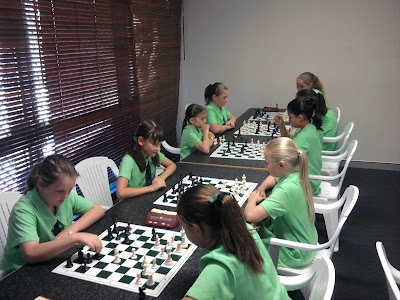 Elite group:This group is restricted to serious Chess Players and will be limited to eight students(minimum four). Students will learn to calculate, prepare, use Chess software and play in a professional manner. homework and a non-disruptive manner is compulsory. IM Peter Froehlich (aka Peter Happy) is known to many of you already and has been coaching Chess in Australia for about a decade. He is going on a business trip to China for a week so his courses will commence first weekend of June. Here he is working hard on our office computer. Who? Long story, well not that long. My family goes by a few different names. Dexler, Texler, Wolkenstein, Misner and a few others I may not be aware of. I was the only Wohl until Nina (my daughter) was born in 2006. In my teens my family decided to unite under a common name, that of our stepdad Heinz Schwaiger. The attempt only lasted a year or two and then we all went our separate names but this phase coincided with the early part of my Chess career. Recently I found an old box containing all my old score-sheets. Some date back to my junior days and have not been looked at for more than thirty years. Time to digitise them! This game was from the first round of the Doeberl cup in 1982. Not an artwork but despite no opposition I played a few moves I am proud of. 13.Ra-e1 shows that already then I liked to play with all my pieces and 16. Kh1 was a forerunner to the famous Kasparov "high class waiting move". 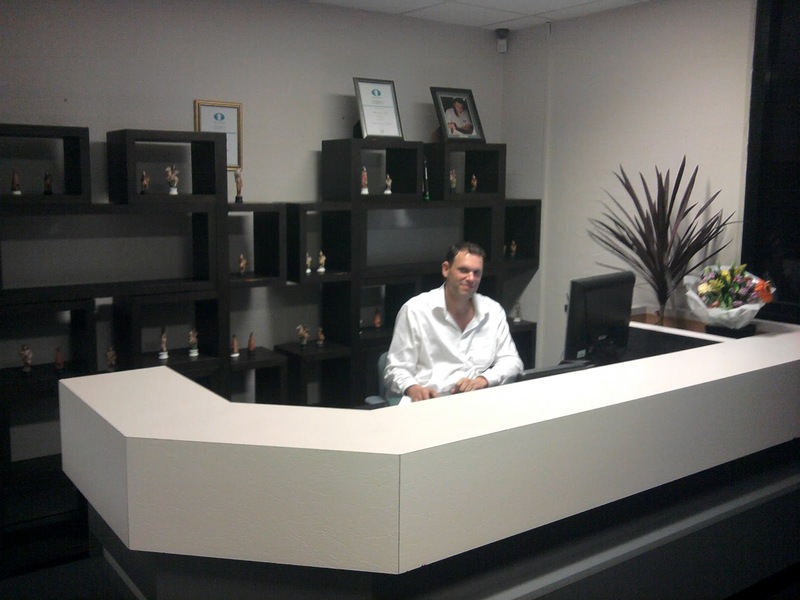 We officially opened our doors yesterday! Yay! A Somerville house training tournament was our first event. 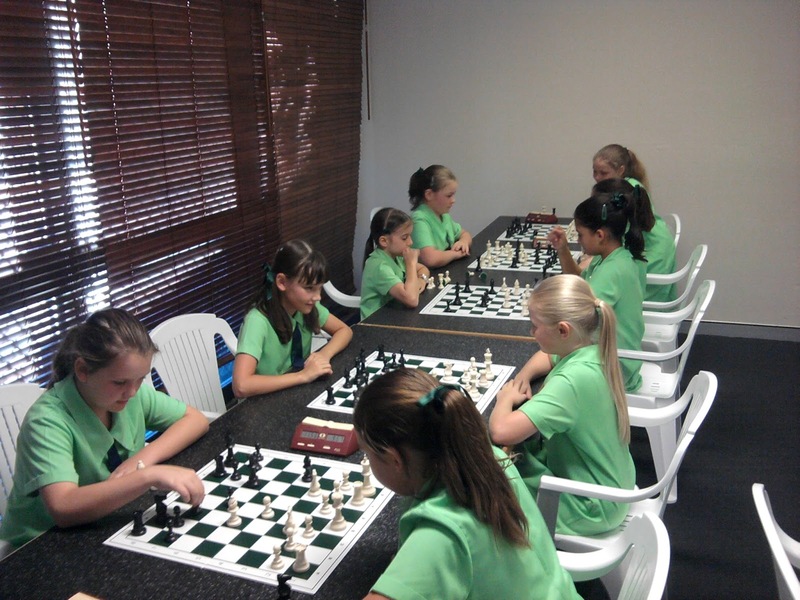 Somerville house has had a dedicated Chess programme for many years. It shows. 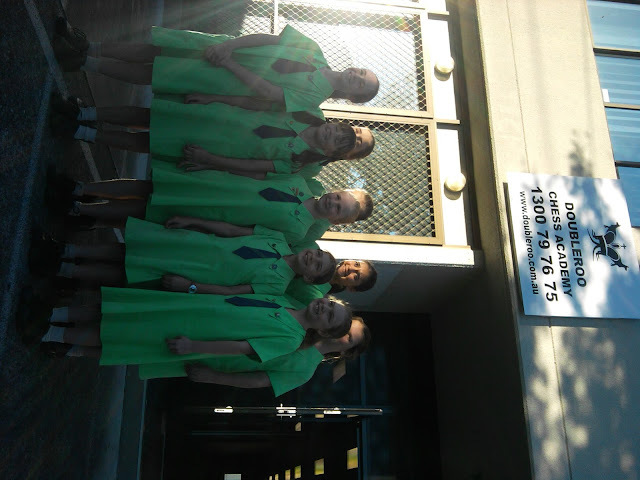 The girls are enthusiastic and highly skilled. Mrs Connie Pizzato and her team of coaches have done an excellent job. Penny dominated this event with 6/7. I am at home now and didn't bring the results with me so full results will be published next post with results from today's Junior open blitz which starts at 1pm. Drinks and snacks will be available all afternoon for parents, friends and all chess-players. In other Chess news, the World Chess Championship has started. So far we have had two extremely boring draws. So boring. If you want to learn how to get as many pieces as possible off the board in the shortest number of moves then check the games out! Last weekend the 47th Peninsula open took place and though I didn't have the time to take part I followed the tournament with some interest. After many adventures IM Steven Solomon and Gene Nakauchi tied for 1st with 6/7 closely followed by Brodie McClymont and Ranga Mashamhanda half a point behind. Kevin Song rated 1050 finished on 4/7 beating a much higher opponent in a pressure last round game. Even more impressive is that he used all his time and remained focused right to the end. Craig Macgregor swung just as hard in this tactical slug-fest but must have missed the point of 26...Qe3, luring the white bishop to d2, where it interferes with the queens defence of the bishop on c2 allowing 27...Qc5 to win a piece. Enjoy. Doubleroo Chess Academy opens it's doors tomorrow (22 Mayneview st Milton) at 1pm tomorrow and our first event is going to be a training tournament for Somerville Girls. Sunday 1pm we will be holding a Junior open blitz. Photo report next post, or if you are in Brisbane feel free to drop in. The selection has been made and yours truly is in the team! Yay! Our highest rated player, Zhao, was selected on top board but had to withdraw as he couldn't get time off Uni. The team is almost in rating order. The only exception is Moulthun Ly who was picked above his rating. This was a good decision by the selectors in my opinion. Young and talented players should be encouraged even if they have some bad results occasionally. Lower down there was a strange decision. IM Gary Lane was picked last in 10th place despite being 4th on rating! I am not privy to all the information available to the selectors , however checking his ratings card I notice Gary has been active and in good form gaining a massive 25 points in his last two tournaments, the Doeberl Cup and the Sydney international, results the selectors were undoubtedly aware of. Curious. Here we have a strange decision. WIM Bilijana Dekic has been selected in 6th spot despite out-rating the three players above her by as much as 100 elo points! I have heard that the Women's team selection has been challenged but cannot find verification online. I have not posted any games recently mainly because I haven't played any. The reason is that I promised a friend I wouldn't. The previous two Olympiads I was left out of the team due to bad play immediately prior to the selection process. My friend, who shall remain nameless told me that I will make the team if I don't play and he would really like me to come to Istanbul so made me promise not to play. It worked! On a completely unrelated topic, a fascinating match took place last week between the second and third rated players in the World, Levon Aronian and Vladimir Kramnik.Lev won the first game, Vlad the fourth and the rest were hard fought interesting draws. According to the match rules, if a game finishes early a rapid game would be played. This occurred only once but what a game!! Blacks play falls into the "don't try this at home" category. First g5, then 0-0, then h5, h4. Do yourself a favour and play through it. Finally I would like to mention the Olympiad Appeal. Australia is one of the very few countries in the World that does not send it's representatives to the Chess Olympics. We have to pay the Airfare ourselves. Thankfully the Australian Chess Community helps offset some of the expense. The target is $17,280 and so far $6,831 has been generously donated. If you would like to help please go to http://www.acfappeal.aunz.org/ Your donations are listed on the site. To the Australian Government I would like to say, thanks, for NOTHING!